Prices saw mixed results on Friday as the week closed. WTI crude oil managed to eke out some small gains, ending just 5 cents higher than the week’s opening price. Today, crude is up 31 cents (.54%) from Friday’s close to trade at $57.61. Diesel saw a small midday hike on Friday before losing strength and closing the day over half a cent lower. However, prices have recouped those losses and more this morning gaining 1.94 cents (1.02%) to trade at $1.9229. 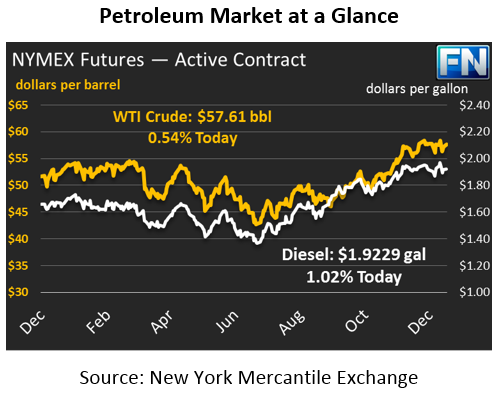 Gasoline prices on Friday saw early gains mixed with large declines, as traders sold expiring January gasoline contracts. Along with falling gasoline prices came lower ethanol prices. Today, gasoline prices are $1.6695, up 1.47 cents (.89%). While Brent crude and NYMEX refined products fell, WTI crude oil rose slightly on Friday, supported by a declining Baker Hughes rig count in North America. The rig count numbers fell by one, to 930 rigs. That level is 293 rigs higher than just one year ago, a 46% rise in a year. Rig counts had risen for five straight weeks, gaining 33 rigs, in the weeks before last week’s decline. While rig counts do not directly correlate with production, they are a good indicator of future production trends. The significant run-up in rig counts shows that U.S. producers are still reacting to rising prices with more production. With the Forties Pipeline in the U.K. still offline, it’s surprising that markets have not reacted with more enthusiasm. The Brent-WTI spread did soar to over $7 last week, but they’ve settled since then and ended the week on Friday at just $5.93. Product flowing on the Forties Pipeline plays a significant part in Brent crude averages, so it is unusual that the 300 kbpd outage has not caused prices to move higher. If repair work takes longer than the estimated two weeks, expect crude oil to rise significantly.